Hi there! My name is Laurel and I love to run. I discovered my love for running very early on in life. Back in elementary school I joined a summer track program and fell in love with the sport. For a determined and competitive little kid, it fit me perfectly. I then went on to run cross country and track in middle school and high school. I liked the 800, mile, and 3200. Once in a while I would even try out the 4×400 for a laugh. Since high school, I haven’t stopped. I’ve run two marathons, roughly 8 half marathons, a few 10k’s, and some 5k’s. I recently started branching off and trying out some new activities also. I absolutely love hiking. I’ve done plenty of hiking in the White Mountains and my friend Ellie and I backpacked the Long Trail a year ago. I’ve also become really interested in bike touring. I biked over 2000 miles on a trip in the northwest US and southwest Canada. I’ve also done a few smaller trips around Massachusetts/New Hampshire and spent a few weeks touring in Alaska. I started writing this blog after taking a few years away from it. The main reason right now is that I want to document my experience dealing with popliteal artery entrapment syndrome. This basically means that the muscles behind my knees have an abnormal attachment and are crushing the main artery that runs there. I had bypass surgery in October 2017 and a muscle release in February 2018 at the University of Maryland. I hope to create some more awareness for this weird condition and maybe provide some more information to somebody else going through the same thing. Thanks for running with me! Looking for someone with firsthand knowledge of both PAES and CECS…….Looks like you’re the girl!! 🙂 My 15-year-old son is an elite soccer player…..Plays for a Major League Soccer Academy. He’s been having symptoms of either PAES or CECS for 5 months now and we are getting ready to travel to Boston to see a physician there for an opinion. Would SO MUCH LOVE to talk to you! I just added my email address to follow your blog……..Would it be possible to either email or speak? Hi Jess, glad you found my blog! Wow, 7 surgeries. You’ve definitely been through a lot! I’m still in the process of learning how to push myself and how much is too much versus too little. It’s honestly just been a matter of experimenting. I’ve found it hard to tell what is “good” and “bad” pain anymore. My PT told me as a rule of thumb that any nerve problems that pop up (pins and needles, numbness) mean that I need to slow down or take a break from exercising. I find it difficult to tell what is just muscle fatigue and what are symptoms of bad blood flow. The cramping/weakness of bad blood flow can feel similar to normal muscle fatigue…. at least at the beginning, and then it becomes obvious that something more is going on. Sorry that probably doesn’t answer your question very well. Honestly I’m still learning how much I can push myself. What type of PAES do you have? Anatomical or Functional? Do you mind me asking what the surgeries have been so far? I’m so glad you created this blog! Yours has been the only useful information I’ve been able to find about Popliteal Artery Entrapment Syndrome – so thank you!! I was just diagnosed officially last week with a “severe” case in both legs. I’ve had lower leg pain plaguing me for years and constantly getting in the way of my running. I’m so happy to know there’s finally a name and a real condition. I was constantly being told it’s shin splints or that I was training wrong and that maybe I’m not mean to be a runner. I’ve been referred countless times to new docs. My Ortho is now handing me off to a vascular surgeon, but no one has actually talked to me since my angiogram to tell me what the heck happens next. I have no idea yet the surgical plan or approach. I’m super nervous and I just want to get it over with. I’m a planner and type A personality, so being able to read about your experiences has been really helpful! Thanks again! Hi Sara, I’m so glad that you’ve found my blog helpful. There is so little information out there about PAES since it’s so rare. And yes, it can be so validating to finally find out the diagnosis. For me trying to find answers was by far the worst part. Surgery and recovery was by no means fun, but I’d rather go through that than still be looking for answers. When are you meeting with your surgeon? Yeah, it can be really stressful waiting and not knowing what’s to come. Good luck with everything! You can do it! and I’d love to hear from you about how everything goes. So I met with my surgeon finally. She’s great and made me feel comfortable about what’s to come. She has only personally seen one other case like mine. (Trying not to let that scare me). After I met her, she sent me to Ultrasound for “vein mapping” and an MRI of my knee anatomy so she knows exactly what she’s dealing with. She wanted to make sure she knew where to find a viable vein if a bypass is needed as well as what in my knee is causing the entrapment before getting in there. The ultrasound showed the exact some result as the angiogram – 100% occlusion in both legs while flexing. I’m still waiting to find out WHEN we can schedule surgery (hoping to hear from her today).This is such a long process!! I’ll give an update post surgery! Thanks again! Hi Sara, sorry for the late reply. That’s great that you had a good appointment with your surgeon. Hopefully you can schedule the surgery soon. Awww, and that’s awesome that you are going to blog about this!!!! This syndrome is so rare, and a blog would help create more awareness for sure. Plus, blogging has kept me pretty entertained this past year. Also, I don’t know if you’ve heard of it or not, but there’s a facebook group for people with this syndrome. “Popliteal Artery Entrapment Syndrome Support”. I’ve found it super helpful, and there’s a list of surgeons that people have seen and their reviews of them basically under “files” if you wanted to check it out. Do you live in the US? There’s people from all over the world in the Facebook group, which is pretty cool. I did find and join that FB group. It’s been very helpful and simultaneously, very scary! I’ve read a lot of horror stories on there and get myself really freaked out. But as someone so cleverly mentioned, the people who had successful surgeries and recoveries, aren’t really hanging around in online support groups, so it’s a bit skewed. All the more reason for me to blog about my own experience – good or bad. I’ll share the link when it goes live. It will be separate from my freelance website, so I’ll share the link when I have it ready to go. I’m getting a second opinion next week – and then I’ll have to make a decision on all this. Oh good, glad you found that resource. It’s true, yeah, I remember getting really freaked out the first time I looked on there. Like you said, it’s important to remember how support groups can be skewed, but there still is some really helpful info on there. And yes, more reason to share your story! Good luck with the second opinion! Spent some time reading and catching up on your blog Lolo. Youre a good writer as well as runner. So nice to see all the pics of fam and friends and familiar sights in Boston. Love you! Excellent running form in that last picture! Well Laurel, maybe your half-finished marathon was a good experience after all. Sounds like you had to dig deep and really reflect to develop such a healthy perspective about it. Triumph is so easy. Good for you! Thank you! I’m trying to look at it in a more positive way, but it’s pretty difficult. Well Laurel knowing when to stop is a sign of a smart runner. It got hot fast and the hills got worse. I hit the wall at mile 21 and had to walk a few times. It was a very tough day, By the way I was the one that recognized you as we ran through Kennebunkport. What were the odds of that happening!!! Hey Laurel – what marathon are you planning on doing? A local VT one? No, I’m running one in Maine – the Maine Coast Marathon. Do you have any races coming up? 50 miler here in Windsor in April. Then Covered Bridges in Woodstock come June. The Shires is a pretty nice marathon, too. I’ve heard that the Covered Bridges race is really cool! Have you ever run the Vermont City Marathon? No. It’s usually the same day as CBHM and it’s a nice fast course – 200 feet of net elevation loss. Maybe next year I’ll give Vermont City a go. oh, gotcha. That does sound like a pretty fast course. Good luck with your upcoming races! Exercise science is a great major. Doing something you love and helping others do it too! You’re so lucky! 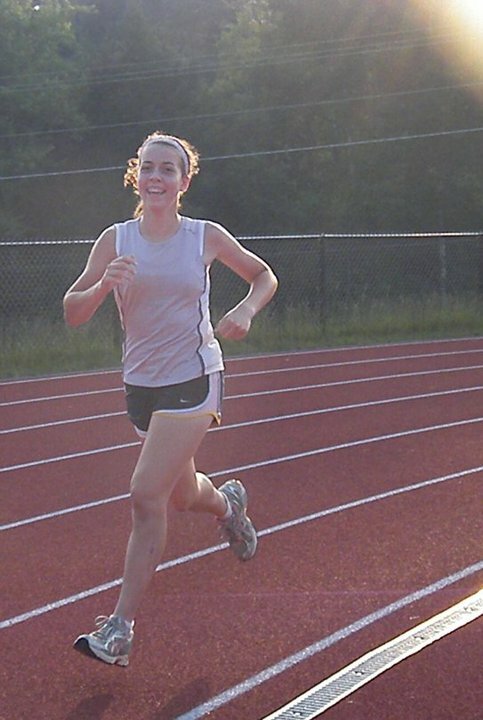 I ran track and cross country in high school, but didn’t continue running competitively after that (except for an annual 5k) until I picked it back up 6 years ago. I wish I had never stopped, who knows what I could’ve accomplished. Who knows what you can accomplish!!! I feel like it’s pretty common for people to stop running after high school and then pick it back up later. or not… some don’t ever pick it back up! Maybe taking some time off, though, will make you appreciate running even more and make you more motivated. who knows?